To understand the resurgent popularity of thrash metal among a new generation of fans one need look no further than Brazilian thrash stalwarts Sepultura. Celebrating its 30th anniversary as a band, the quartet unleashed their “bestial” brand of devastation on young and old at Vancouver’s Rickshaw Theatre last Friday with a balanced mix of pre- and post-Cavalera songs (brothers Max and Igor, founding members on vocals/guitar and drums respectively, separately left in 1996 and 2006, replaced by Derrick Green on vocals and drummer Eloy Cassagrande; the band is rounded out by original bassist Paulo Jr. and principal guitarist Andreas Kisser.) Highlights included “Territory” – a song to which Vancouver’s embattled renters can certainly relate – and “Refuse/Resist,” an anthem of youthful rebellion and a poignant protest against oppression. Local act Medevil, winners of the BC round for Wacken Metal Battle Canada 2015, opened the show with characteristic zeal and treated the earlybird crowd to a rapid-fire cover of Metallica’s “Creeping Death” – a good choice to showcase Liam Collingwood’s classic metal voice, which purrs and snarls somewhere between Ronnie James Dio and Overkill’s Bobby Blitz. Razor-sharp sets of death metal followed from Micawber and Arsis, setting the stage for the surgical-strike precision of Destruction’s subsequent thrash blitzkrieg, which was accompanied by an explosive display of the Rickshaw’s recently upgraded stage lighting. 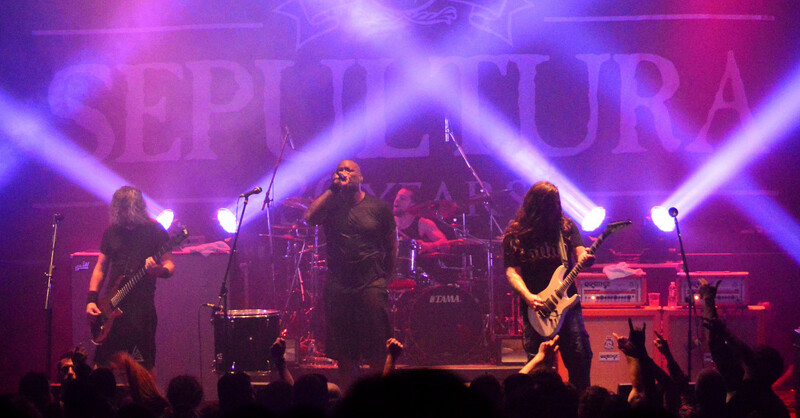 Sepultura’s 30th anniversary tour with Destruction, Arsis and Micawber continues through June 14th 2015. Medevil’s campaign for metal mastery encamps at the Wacken Metal Battle finals on June 6th in Toronto.